Si II 635.5-nm feature, measured at the absorption minimum, is about 21200 km/s. Further to CBET 2561, K. Lin, M. Kandrashoff, S. B. Cenko, W. Li, and A. Additional KAIT magnitudes for 2010kh: Oct. 14.14 UT, [18.5; Nov. 19.12, 17.5. UT by M. Calkins with the F. L. Whipple Observatory 1.5-m telescope (+ FAST). that 2010kf is a type-Ia supernova about one week past maximum brightness. south of the center of the presumed host galaxy, 2MASX J23160991-0214004. 17.3 (Itagaki; pre-discovery; 0.50-m f/6 reflector); Dec. 3.062, 16.3 (T.
before maximum brightness. Extensive follow-up observations are encouraged. with lines from O I, Mg II, and Si II found between 18000 and 20000 km/s. identifications are made for Si III and Fe III. CI is not observed. two supernovae in the course of the Mt. Lemmon Survey. at redshift 0.213 +/- 0.005. S. Howerton, Arkansas City, KS, U.S.A.; A. J. Drake, S. G. Djorgovski, A.
the Catalina Sky Survey (CSS) 1.5-m telescope. (CGCG 484-24) has redshift z = 0.023. Further magnitudes for 2010km: Nov.
17.19 [19.5 (CSS); Nov. 28.35, 19.2 (CSS); Dec. 5.31, 18.7 (MLS). that 2010ki is a type-Ia supernova about one week past maximum brightness. at mag about 15.7 (with position end figures 49s.8, 50".0) was obtained on Dec.
visible at this position in Leonini's past images, including two on 2009 Dec.
confirmation image is posted at http://tinyurl.com/2vjwmyw. image taken on Dec. 1.608 UT, which indicates that this is a recent outburst. M31N 2010-10d, were reported, with details given below. end figures 37s.01, 30. "8, magnitudes V = 22.6, B = 23.4, R = 22.5). unfiltered CCD camera and a Celestron C14 Schmidt-Cassegrain telescope at Mt. Nanshan. The new object is approximately located at R.A. = 0h42m36s.97, Decl. an apparent nova in M31 on a co-added 1260-s R-band CCD frame taken on Oct.
0h42m36s.91, Decl. = +41o19'29".6 (equinox 2000.0), which is 84" west and 201"
Hornochova); Nov. 3.070, 17.55 +/- 0.1 (Hornoch). Szeged; R. Quimby, California Institute of Technology; N. Whallon, S. B.
Pandey, F. Yuan, and C. Akerlof, University of Michigan; P. Pasque and M.
shows that 2010kn is a type-Ia supernova, a few days before maximum light. type-Ia-supernova features. According to SNID (Blondin and Tonry 2007, ApJ. minimum of the Si II 635.5-nm feature) is 11000 km/s. (equinox 2000.0), which is 151" east and 476" south of the center of M31. University of Szeged; R. Quimby, California Institute of Technology; S. B.
discovery of an optical transient in M31, located at R.A. = 0h40m24s.39, Decl. by Xing Gao in the course of the Xingming Observatory Sky Survey around Dec.
posted their images at website URL http://www.xjltp.com/XOSS/XM02JR/XM02JR.htm. 17.5 +/- 0.3 (with respect to USNO-B1-catalogue data). 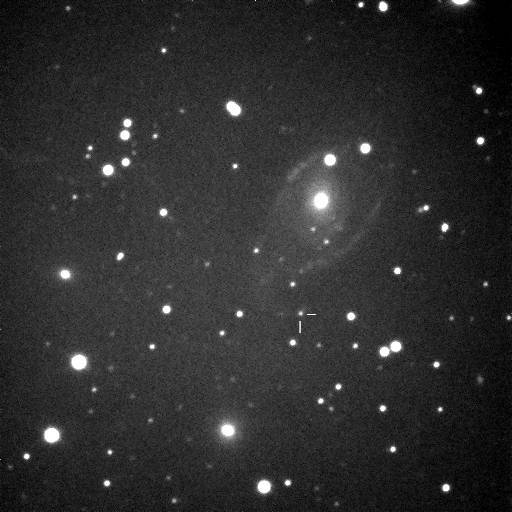 imager on the 1.83-m Vatican Advanced Technology Telescope on Dec. 5.515 UT. magnitudes as faint as Sloan r' = 23.0, R = 23.1, V = 23.5, and H-alpha = 22.1. (equinox 2000.0), which is 82".9 east and 43".5 south of the center of M81. Available magnitudes measured by Hornoch: 2010 June 11.164 UT, [22.9 (P.
at Ondrejov; unfiltered, using R-band magnitudes from comparison stars); Dec.
1.83-m Vatican Advanced Technology Telescope). on the Digitized Sky Survey (limiting mag 21.0; no bandpass provided). California Institute of Technology; J. L. Prieto, Carnegie Observatories; M.
Catelan, Pontificia Universidad Catolica de Chile; E. C. Beshore and S. M.
Larson, Lunar and Planetary Laboratory, University of Arizona; and E.
supernova in public images from the Catalina Sky Survey (CSS). magnitude estimates for 2010kq (unfiltered unless otherwise noted): Nov.